In this Vilcanota range you can hike at heights above 5000 m and have fabulous panoramic views at cristaline lakes and nearby mountains.You can see the tipical Andean animals as lamas, alpacas and vicuñas, meet local people who speak Quechua and know about their religion (their contact with the Apus, the mountain spirit) , customs and life in the Andes.This hike is quite a long and difficult one (you walk 7-8 hours a day), so we recommend to prepare well, doing shorter walks at altitud during 3 days before starting the hike. CUSCO-OCONGATE-Tinki (3950 m.s.n.m.) The departure is scheduled early in the morning in order to be able to stop along the route. We will pass through nice villages of the Andes in the heights of Urcos, the sightseeing offers us the spectacular view of the Vilcanota mountain range. After traveling for three hours, we will arrive to Ocongate, an important village of much historic significance. 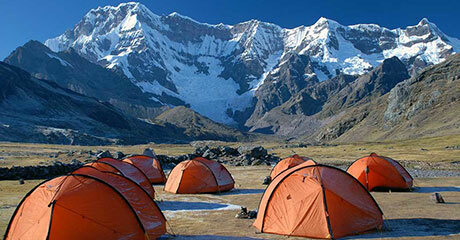 We will then reach the village of Tinky, at 3,850 m.a.s.l., to a nice and typical hostel, where we will spend the night. This is the spot where our trek begins. Tinki-UPIS (4200 m.) After breakfast, we will start the trek towards the mountain crossing, at 4,500. m.a.s.l., in order to continue through the outskirts of the snow peak Ausangate towards the camping-site of upis. Along the way we will witness lagoons of a variety of colors, as well as grazing llamas and alpacas. UPIS-Pacchanta (4450 m.) The next day, after having breakfast, we will prepare to start the trek towards pacchanta. The way is quite clear, with a continuous and moderate slope. The trek takes five hours, in front of a group of mountains, with a really marvelous scenery. The camping site is very close to the glacier, giving it a special location and nice view to take some pictures. Optionally, you may have a bath in the thermal waters close to the camping site. Pacchanta-Tinki (3950 m) CUSCO On the fourth day we will walk approximately for three hours to the village of Tinki. We will have lunch, and then take the return bus to Cusco. Transportation to the start of the road. dining tent, kitchen tent, chairs and mattress. Horse for extra personal items. warm clothing for the first day. Light clothing, four pairs of socks. Note: During the walk you must load the sleeping bags, mattresses and personal items (eg backpack).